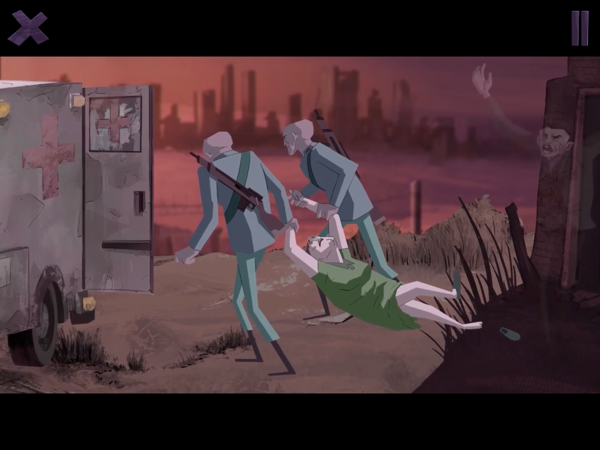 Dead Synchronicity: Tomorrow Comes Today, by Daedalic Entertainment, is advertised as a dark, disturbing, dystopian point-and-click adventure, and it more than delivers on that promise. This is a game that’s mostly devoid of humor and has you making some morally questionable decisions to “do what you gotta do” to get things done. 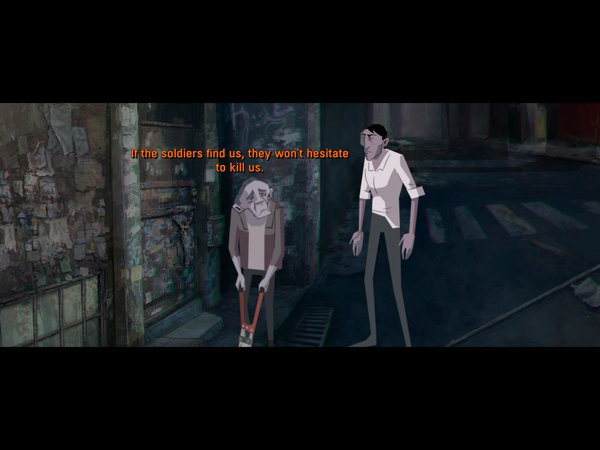 The game starts with the protagonist waking up in in a trailer home in a refugee camp, his memories missing. He’s able to remember that his name is Michael, but not much else. The people around him refer to him as a “blankhead.” He learns quickly that the world he woke up in is a harsh one, when he sees a woman dragged away by police and an unarmed man shot in cold blood simply for trying to stop them. This also sets the stage for what you can expect to see in this game. It’s not for the faint of heart. By asking questions, Michael soon finds out that some weird phenomenon called “The Great Wave” devastated the planet, leaving a huge gash in the sky. Since then, people have been getting sick to the point that their bodies just melt. For this reason, they’re called the “dissolved,” and they’re also taken from their homes to be quarantined. Anyone caught trying to hide a “dissolved” can be shot by police whose power have gone to their heads. The police can actually shoot just about anyone for any reason and not be questioned. Michael then sets off on a quest to find out who he is, but also to see if there’s anything he can do to help the people and the world around him. He’s a likable character, who is genuinely remorseful about certain actions he has to take to get further on his mission. Strange things also start happening. He has visions of the past and sees things others can’t. Theres a lot of mystery surrounding both him and the world around him. Right away, the story had me sucked in, wanting to find out what’s going on and who he really is. 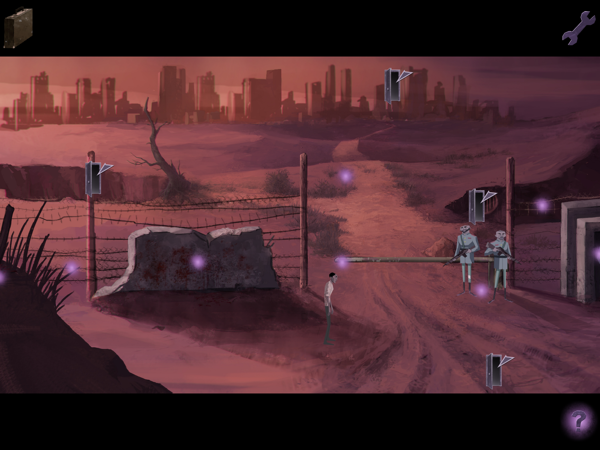 Dead Synchronicity is your typical point-and-click adventure that has you finding objects and using them in creative ways to achieve your goals. I was able to solve most puzzles on my own, but did cheat a few times when I got really stumped. The game gets pretty big near the end, and it gets a bit tiresome to walk around, seeing if you missed anything. But that can be said for most point-and-click adventures. The main thing is that all the puzzles were logical, even when they were tricky. Perhaps a few could have used less back and forth, but those were mild nuisances in an otherwise solid game. To make things less frustrating, the game does have a hot spot button in the corner. This shows you all the interactive areas on the map so you can spend your time solving puzzles instead of pixel hunting. I actually find that a must-have in point-and-click games like this one, so I’m glad it was included. The controls themselves are also adapted well for touch screens. Besides collecting and using items to solve puzzles, you also need to talk to other characters and exchange favors with them. The story itself is told through hours and hours of voice acted dialogue. With the exception of one gruff character awkwardly saying “dude” too many times in his thick British accent, the dialogue and voice acting are spot on and top quality. They captured the mood perfectly, as well as my attention. 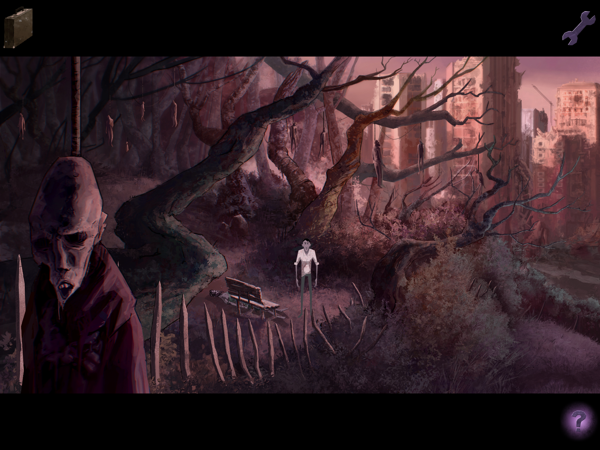 The gorgeous 2D hand-drawn graphics also capture the setting perfectly. The tones are earthy, never too bright and colorful, but there’s still a beauty to them despite the horrific world they’re depicting. Even blood spurting out of a punched mouth is artistically done. There are certain cutscenes that pop up randomly and are interesting the first few times, but they get old after you’ve seen them ten times already. Thankfully, all cutscenes and dialogue can be skipped or quickly fast-forwarded through with a few quick taps on the screen. I would have preferred that these cutscenes be more varied to make them more interesting, but at least you’re not forced to sit through them each time if you’re tired of them. I also encountered a few weird glitches, like the screen freezing or the game not auto-saving. But for the most part, these were non-issues. Since there are ten manual save slots, you can save as often as you like to avoid any issues. For the most part, the game did automatically quick-save as well, but I recommend saving frequently just in case. Unfortunately, the game ends on a bit of a cliffhanger and the sequel is still in development. There’s also no confirmation yet that the sequel will come to iOS. But even you never get to see the sequel, I think it’s a game worth playing. The production values are top quality and everything feels polished. Most of all, the story is engrossing. There are a few things that can be frustrating, but they’re typical of point-and-click adventures and it would be a shame to dismiss this game over small frustrations. 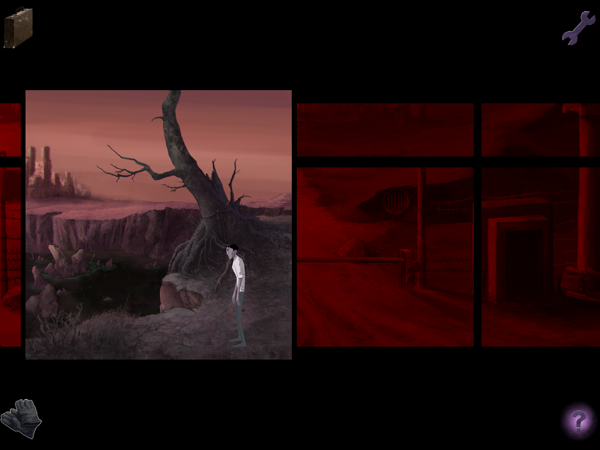 As long as you don’t mind a dark, disturbing game, I would highly recommend playing Dead Synchronicity. If this all sounds good to you, you can download the game here. 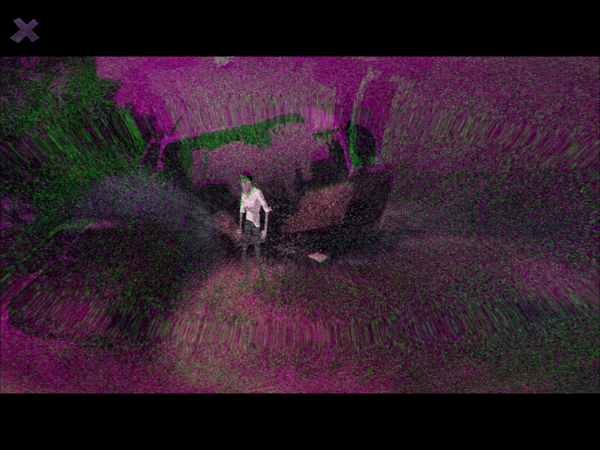 If you’re playing the game and get stuck, you can try my Dead Synchronicity walkthrough.